Planet Earth is blue and there's nothing I can do.. SPOILER ALTER don't watch the video IT'S A WALK THOUGH. I don't want anymore angry emails like I got from Gruds in Space. Mission Asteroid is a Hi-Res graphical adventure from Sierra-Online. Programmed by Ken Williams and story written by Roberta Williams this adventure was aimed text & graphical "newbies" of the time. Despite Mission Asteroid being numbered Hi-Res Adventure #0 it wasn't the first Hi-Res graphical adventure that Sierra-Online had released. Both Mystery House (Hi-Res Adventure #1) & The Wizard and the Princess (Hi-Res Adventure #2) predated the release of Mission: Asteroid. Like all other Hi-Res Adventures from Sierra-Online, and many other companies, the player is given a quest to solve. The quest in Mission Asteroid is a pretty big one... save the world from impending doom! There's an asteroid heading right for earth that if not stopped will destroy earth and all life as we know it! It's your job to save man kind! You play the astronaut hero of the story who is ex military (it's never really said what military branch you're from but there's a general whom you have to salute so lets say Army ;) who'll fly into space and blow up "Ragnarök". To get there you'll have to solve a couple of simple puzzles and one really annoying one*. This is a linear adventure so most of the action & events take place in a said order AND must happen in a set amount of time/moves. The rock will hit earth at 7:15. Each command the player gives the computer counts as 5 or 10 minutes. Each time you look at your watch it counts as 5 minutes. Move East? That's 10 minutes. Messing up where you go can take away a LOT of time. Simply look at your watch 87 times and you've doomed mankind to extinction! The player enters in commands in two word phrases at the bottom of the screen. Commands must be formed VERB NOUN like "OPEN DOOR", "GO EAST", "SAY HELLO", and of course "| GET LAMP". The command parsing system doesn't take anything more than two word commands, however, when you get to a specific point in the game you have to put something into something else. The command "PUT THING INTO THING" doesn't work. Take note it's not thing, I don't want to spoil the FUN for anyone aiming to play this game after reading this. Also AGAIN SPOILER ALTER don't watch the video. As mentioned before this game was aimed at graphical adventure newbees and as such isn't as complicated as later titles like Cranston Manor or Ulysses and the Golden Fleece. 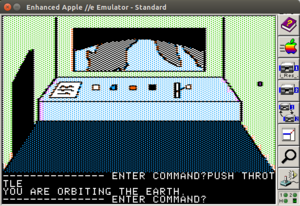 The game can be solved in about an hour once the player is able to figure out various commands and how to enter them. There are no really tough to solve puzzles and most objects needed to finish/solve the game are quickly found. I've used this game as an introduction to graphical/text gaming to my 6 year old son and 4 year old daughter. Both find it challenging but not so much that it's frustrating. As of this writting the game is 34 years old and still very entertaining. This page was last edited on 3 August 2014, at 15:51.